Scroll down this page for pattern links but first meet Bob, Marilyn and Elinor! that's ok because she doesn't want one. She has so much fun going to the fair with her friends and her favorite thing in this whole world is caramel covered apples, yum! I hope you enjoyed meeting Bob, Marilyn and Elinor... and if you want to make a pig just like them, you can! 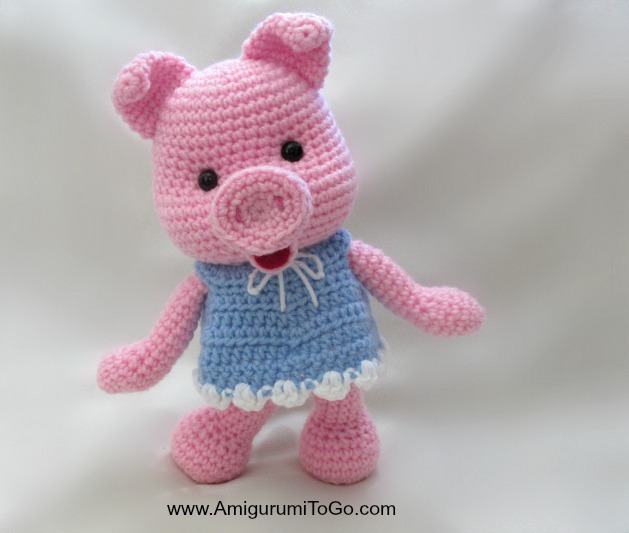 Click here for the Pig's pattern. There's a full video tutorial too. Have fun making your pigs! I'm so glad you stumbled across the blog and I hope you always enjoy yourself while you are here.. I make a lot of animals, both knit and crochet. And donate most to charity. A few special ones end up on my spare bed for guests to enjoy. I, too, create a lot of my own patterns and share with friends. Thank you to all the creators. Thank you for a wonderful pattern again! that's awesome, I'm so glad you are enjoying the patterns. It is so nice to finally meet you all! I've been so looking forward to it. I can see that all 3 of you are just the sweetest pigs! I hope to have 3 little pigs just like you living in my home very soon. And by the way, I just love your clothes! I bet you all feel just as proud as can be all dressed up like that. psst, Sharon....get working on that donate button! Everyone who comes here appreciates your generosity. Now don't be shy! Thank you so much Linda, and Bob, Marilyn and Elinor say a big thank you too! I truly appreciate all your kind messages, they mean a lot to me. I enjoy what I do and people like you just make it even more enjoyable. you're welcome and thanks so much! 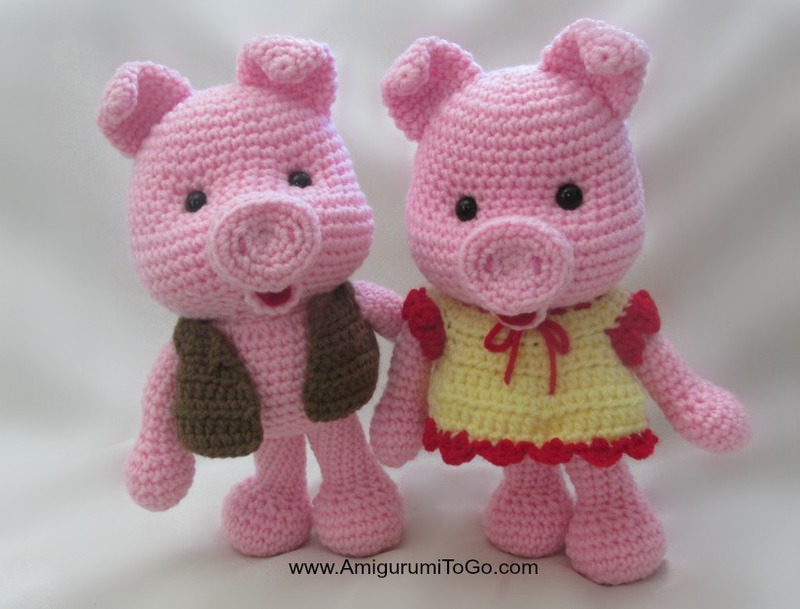 The piggies are sooo cute, thank you for the wonderful pattern! I love the dresses, somehow there's nothing cuter than an amigurumi in a dress. :) Have a nice day! I am so in love with your patterns Sharon!!! I've yet to actually make one (I'm still in the learning phase) but am determined to create your panda (when completed of course) for my son's birthday in November. You are so very generous...thank you!!! And you're welcome ~ have fun!! I can tell from your work that you have a great sense of humor. I'm giving this website to my crochet students to get patterns from. They will love your pigs. i have just introduced my granddaughter to the three little pigs story and now have to tell it everytime we visit so looking forward to seeing her face when i turn up with the actual pigs. thank you so much for the pattern. wow! I visit your blog and the pig is so beautiful! Thank you so much for the patterns. My grandchildren will love them. I've made a pig so far and cant make my mind up as to what to make next. They are all so adorable and so easy to make. Thank you again for you generosity. Wow! You are an amazing pattern designer. Thank you so, so much for sharing all of your beautiful, hard work with us. I really appreciate it. 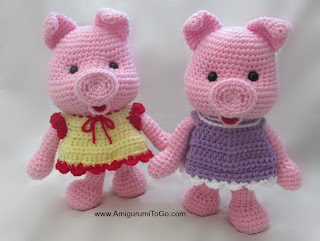 Like all other ladies I have admired your beautiful patterns, and now I have decided to make these cute piggies for my gr.child to be born in april. As I have no idea of the gender of the baby, I am going to make a female & a male piggy. The only question I have is the amount of yarn needed for each doll...Thanks in advance for a quick response! You are amazing! They are adorable! Another one for my to do list, thank you. I LOVE your patterns! I've made a few of them over the last year since I started crochet and there are lots more I'm still to make. In fact, it was through one of your videos that I learned how to make amigurumi. Thank you so much, Sharon, for the time you put into these patterns, for the joy they give and for making them so freely available. ik kan nergens dit patroon vinden, wel de foto's maar niet de beschrijving van hoe te maken. This is totally not related to pigs, although I do plan to make them someday. .. when I actually reach that level. Right now, I'm still a novice at crochet. As a novice, I found your technique for making the ever essential "magic circle" to be the best one for me. After practicing your method, my own magic circles now look like proper magic circles, instead of tangled yarn pretzels. Many Thanks! I am not sure how to do the comments here, so I went with Anonymous. My name is Becky. Thanks so much for the cute patterns. I want to make a set of pigs for a neighbor, but was thinking of making the Bunny overalls for the boy. Are they the same size or would the pattern be fairly easy to adapt? Thanks again! Your patterns are so cute! Has anyone made any, I don't crotchet and would be willing to pay for them for a fair price and without the clothes.